Farrar, Straus and Giroux (BYR), 9780374300593, 336pp. Ben touched seven parts of Mira Cillo: her palm, hair, chest, cheek, lips, throat, and heart. It was the last one that broke her. After Mira's death, she sends Ben on a quest to find notes she left him in the seven places where they touched—notes that explain why she and her sister, Francesca, drowned themselves in the quarry lake. How Ben interprets those notes has everything to do with the way he was touched by a bad coach years ago. But the truth behind the girls’ suicides is far more complicated, involving a dangerous infatuation, a deadly miracle, and a crushing lie. 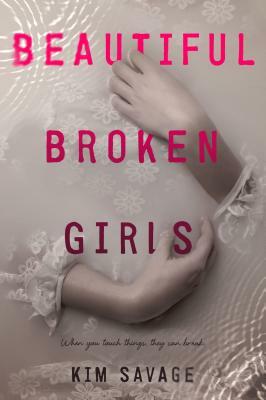 BEAUTIFUL BROKEN GIRLS is a stunning release from Kim Savage, the author of the critically acclaimed After the Woods.